Lord, I am a baby to this life! If there’s a choice between liquid or dry, always choose dry. Every coffee shop has an electrical outlet somewhere. Ask Walmart if they allow overnighters. They’re usually really nice. Keep the windows open as much as possible. And now for some tips on busking! Harass the passerby at every opportunity. Threaten to play until you get a tip. Comment on their outfits. Wear your prettiest, weirdest outfit. Leave no more than $2 in your case at a time. Spent yesterday scoping out Davis Square in Somerville, MA. I’m headed there now, to busk for the first time. Wish me luck! At the Damariscotta Pumpkin Fest last weekend, I met a lovely young woman (she was excited to find my dog was a Xolo – she had thought it was a mythical breed) who was raised as a traveler, part of a family band on permanent tour. She elected to settle down in high school and left the itinerant life behind. She was a great soul to cross paths with! Helped me feel a little less crazy for choosing this life. Plus, Damariscotta Pumpkin Fest is awesome. All the local businesses have artists carve/paint/decorate these enORmous pumpkins, which line Main St. Plus, they shoot pumpkin rockets. More on that later. Having a ball visiting wonderful folks around Boston, plus meeting new friends (Hi, Steven!). 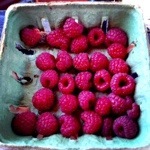 Feeling spoiled by the great food I’m eating, and I’m polishing off raspberries from my father’s house as I write. I’ll let you know how my first day on the job goes! Mind, blown. New and amazing way to go to bed at night. That’s why I’m here. Heading an hour farther north in Maine may seem lunacy for a girl who loathes the cold, but these two inspire me beyond all else. I wouldn’t have made the brave choices I have made without their influence on my life. Gary looms large at the dining room table, a tall and soft spoken man. He fetches me a book on how to be your own booking agent and a photocopied packet on playing guitar. He is dressed entirely in cream, with cream snakeskin cowboy boots and a backwards-cocked black beret. Goals, dreams, destiny. Preserves for the road. I hope when it finds me, it looks something like this life they lead. So far, my journey has included a poetry reading, two long stays at coffee shops, Japanese food, a parking ticket getaway, a Wiccan ritual, and a mini-love affair. So far, so good. It’s hard to imagine being far from this city. The small-town feel, familiar faces, artistic bent, and earthy Maine-ness make for a killer combination. I should have stopped to busk in the park on Exchange St, but melancholy for my city stopped me. I know she has other lovers, and I don’t expect her to pass her time without me alone, but I hope I find my way back to her arms. And that’s what’s breaking my heart. I left the farm where l’ve been living at the eleventh hour last night. Dishes done from the going-away party, van finally fully loaded. Teary goodbyes with my wonderful friends (plus one gruff “Whatever – see you in two weeks when the van breaks”). First stop, an old flame. I wish I could say I loved him enough to stay if he asked me, but all the love in the world can’t warm these bones in a Maine winter. Who would you miss if you left your life behind? I think although the names are easy enough to predict, the degree to which you will miss them never is. 2. I don’t have to live where the winters are cold if I don’t want to. Astute, succinct. It’s so simple! The choice so simple, the repercussions so vast. I fly south for the winter, and lives will go on without me. Friends will change. We won’t dance together at our wedding, and my children won’t have his beautiful hands. Who will I miss? That’s easy. But how much? How much will I miss? It’s 6 am and I’m awake. In October in New England, the sun isn’t even up yet, so my body has no excuse. l always thought people were kidding about waking up so early automatically. Same as I always thought people were lying about liking the cold. “Ooh, it’s so cold out; I love it!” Oh me, too! Totally! Nudge, nudge, wink, wink. Just more of that dry Maine sense of humor, I thought. In the past few years, though, I’ve learned that, No, there really are people who love the cold. Just like there are actually abberent creatures (Hello! Here I am!) who wake up before dawn, in the absence of all reason. I can’t figure it out. l have nothing to do today; why am I awake before noon? I’m trying to embrace it. I very strongly believe that we can only buck the trend of ordinary, we can only ever achieve personal greatness, we can only ever become the best version of ourselves, when we acknowledge and subsequently embrace our inalienable truths. Hence, I live in a van. The federal government would call me homeless, but that’s not true – this van is my home. It doesn’t fit their definition, but it definitely fits mine. Here I am on my bed in my bedroom, writing. A foot from me in any given direction is my closet, my kitchen, my pantry, my studio, and my garage. A whole life in 275 square cubic feet. l’ve always loved things that were made on a smaller scale. It’s also a life in motion, and I owe a great debt to the close friend who made me face that aspect of myself. Maybe someday l’ll find one spot to call home, but it hasn’t found me yet. For now, I have wildly itchy feet and a home that comes with me. Maybe that’s like saying I love the cold; maybe you’ll think I’m joking. No hard luck led me to this, although hard luck I may find along the way. You see, this is my first day. I threw myself an amazing going-away party last night, and today my travels begin.